I think it’s vital for you to know that you’re unique. Once you do, you’ll realize how much of a difference you make in determining whether the prospect buys your product. Let’s face it; we each have a monopoly on our own unique combinations of attributes. No matter what you sell, you make a difference. There are nearly 2,000 life insurance companies offering the same products; all stockbrokers selling listed securities have the same stocks and bonds to sell; real estate agents sell multiple-listed properties. The same is true in the office supply and equipment field, in the retail clothing business, in the supermarket industry, and so on. What this all boils down to is, you must sell yourself. The prospect must like you and believe in you. If not, there is no reason anyone should buy from you instead of someone else. I’m not suggesting that you sell yourself so exclusively that you fail to sell your company. While I do believe that you’re the more important of the two, the reputation of your company is a strong selling feature to help close sales. 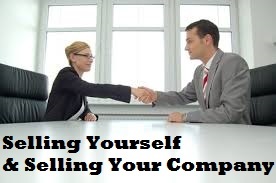 It is particularly helpful in establishing credibility when making a cold call. While a prospect might not be familiar with you, he is certain to recognize the name of a prominent company such as General Motors, Prudential, Merrill Lynch and so on. Knowing that you are associated with a reputable firm helps erase doubts that the prospect might otherwise have about doing business with a stranger. The prospect is presold on knowing your company will stand behind its product. Then too, the prospect knows that prestigious organizations hire top-quality people, so in a sense you’re selling yourself when you sell the good name of your company. It’s a mistake not to sell your company’s strong points. Some salespeople hesitate in doing so because they’re insecure. They think that if they ever leave to represent a competitor, the customers will continue to do business with the original company. In reality, if you treat your customers properly, they’ll follow you to the ends of the earth to do business with you. Stop and think about it. When you buy products isn’t it true that your loyalties lie with the representative? As our society becomes more and more service oriented, the salesperson’s role becomes an even greater factor. What if you represent a smaller or less-known company? Then you must concentrate on building a reputation of excellence on your own. You must rely on your own strong points while pushing the attributes of your company. Who knows? Perhaps with your finesse and know how, you can put your company on the map. In fact, I put my dealer on the map. At dealer’s conventions, he’d draw crowds of people asking questions about me. In fact, no matter what size firm you represent, the customer probably will have few if any contacts in the company with anyone but you. You are the only human contact the customer ever has. So in a sense you the salesperson are the company! Demonstrating your belief in your company and the product you sell is basic and is applicable to every product, not just automobiles. And you should also believe that you sell the world’s number one product—YOU!